Every new-press launch faces this basic challenge: How to effectively and reliably convey parts and scrap out of the press at maximum possible press speed without inhibiting the ability to execute quick changeovers and without compromising safety. Within the confines of the sheetmetal division at Miller Electric Mfg. Co., Appleton, WI, engineers planning installation of a new 400-ton mechanical press faced this challenge head-on. With the help of stamping-system integrator TCR, Wisconsin Rapids, WI, the firm has specified and engineered a unique part- and scrap-out solution for a new press line slated to enter production in early July 2012. The impetus for the mechanical-press project comes from the desire within the Miller Electric sheetmetal shop to add capacity while also allow the shop to satisfy from its internal customers—some 20 welding-machine assembly-lines. “Our customers are als looking for us to provide more frequent deliveries of smaller part batches. It’s all part of a longer-term lean strategy,” says Miller Electric manufacturing engineer Adam Utecht. Miller Electric’s new press line features innovative scrap and part-out conveying solutions. Scrap will be funneled off the rear of the press (left) through a trap door in the floor, where a steel hinged-belt cleated conveyor awaits to move scrap a from the press and then up and out of the floor to a bin. The job of moving stamped parts out of the press will fall to a belted conveyor (right) that includes imbedded magnets in the drop area to avoid part slippage and allow rapid conveyor acceleration. To allow quick changeovers, the conveyor can slide in and out to accommodate a range of die sizes, and its tail pulley can easily (and tool-free) be raised and lowered to match die height. The goal with the new mechanical-press line is to boost press speed from a maximum of 17 strokes/min. capable when running progressive dies on the shop’s existing 440-ton hydraulic press, to as much as 60 strokes/min. on smaller bracketry with the new mechanical press, a 400-ton Aida straightside. Other than a smaller 175-ton hydraulic press also capable of running progressive dies, the rest of the stampings coming from the shop run on a set of four hand-transfer hydraulic presses. While the significant boost in press speed alone is a worthy goal for any shop, Utecht and his project team also sought to minimize changeover time and maximize press uptime. Here’s where clever conveying-system design came into play. Running at a maximum of 17 strokes/min. (and maybe half that rate with manual-transfer operations), scrap bins don’t fill up all that often at Miller Electric. But once its new mechanical press gets up and running, Utecht expects the bins to fill quickly. Stopping the press to empty scrap bins is not an option. 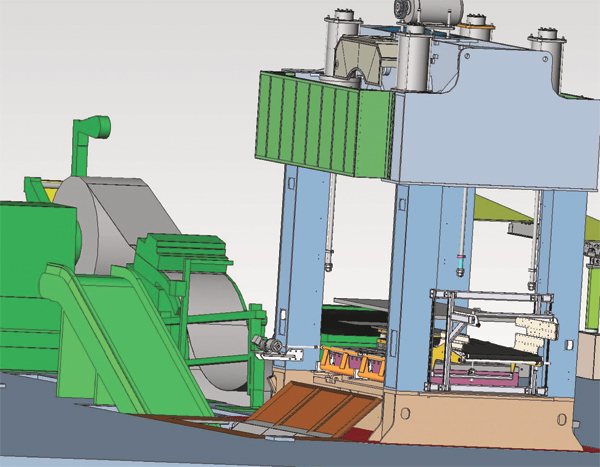 The scrap-handling solution developed by TCR for Miller Electric’s new press will funnel scrap off the rear of the press (see the CAD-model screen capture) through a trap door in the floor where a steel hinged-belt cleated conveyor awaits. The conveyor, which sits in a 3-ft.-deep pit, will move scrap a from the press and then up and out of the floor to a scrap bin. The floor section of the conveyor acts as an accumulator, which will allow the press to continue to run while the conveyor pauses momentarily each time a fork-truck driver exchanges scrap bins. The job of moving stamped parts out of the press falls to a 42-in.-wide by 96-in.-long belted conveyor from QC Industries, rated to 233 ft./min. The conveyor was specified wider than the press’s Coe feed line “to handle larger stampings such as case wrappers and doors, and so that the conveyor would not be a bottleneck for future parts,” says Wenzel. Conveyor features include a cut-resistant top, a stainless-steel frame and imbedded magnets in the drop area to avoid part slippage and allow rapid conveyor acceleration for speedy part removal. To allow press-setup technicians to quickly change the line over, TCR engineered the conveyor’s mounting system to allow it to slide out of the bolster area to accommodate longer dies while allowing it to extend into the die area to reach shorter tools. The mount also incorporates a pivoting mechanism so the setup technician—no tools needed—can raise and lower the tail pulley to match die height. Last but certainly not least, Wenzel points to the built-in safety arrangement of the conveyor design. “Often, the challenge for designing the exit end of any press opposite the feeder is guarding,” he notes, within the context of providing enough room and access to allow the operator to efficiently move parts a from the press, while preventing him from reaching into the die.